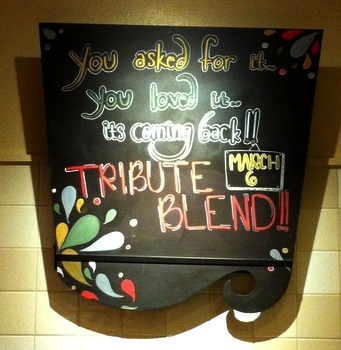 Home ♦ Coffee ♦ Tribute Blend Returns March 6! Tribute Blend Returns March 6! Fans of the Starbucks Tribute Blend – like myself – you’ll be happy to know that Tribute blend is coming back to Starbucks stores on March 6th. The coffee was originally released in honor of the chains’ 40th anniversary and was made up of a blend of coffees from all of their coffee-growing regions. It was a huge hit – especially with fans of darker roast coffees, who loved the character of this blend.